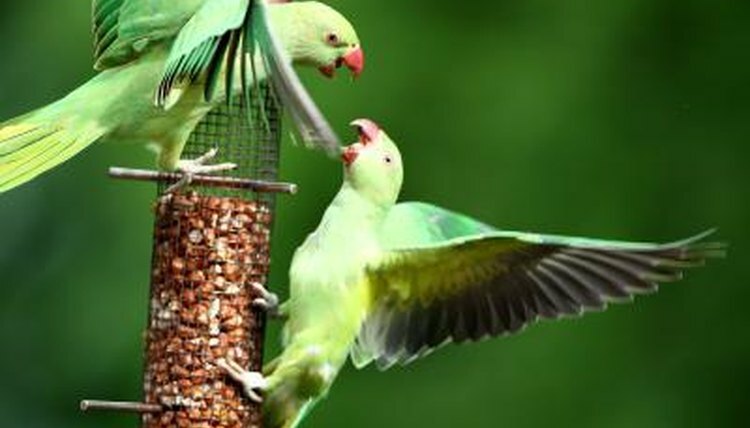 As their name suggests, Indian ringneck parrots originated in India and the Indian subcontinent. However, feral populations also exist. While males have colored rings around their neck, females do not. These birds reach roughly 14 to 16 inches in length, including their tails. Although their average lifespan is about 15 years, they've been known to live in excess of 25 years, so owning one isn't a commitment to be taken lightly. Your Indian ringneck needs a large cage so she has plentiful room to hop around and flap her wings. The minimum size, if housing a single bird, is 24 inches wide, 18 inches deep and 36 inches high. However, if you have room for a bigger aviary, larger is always better. Ensure the bars are spaced no more than an inch apart, to avoid injury. Bars should be made of stainless steel or coated in non-toxic, chip-resistant paint, as these birds are prolific chewers. A healthy, well-balanced diet is essential for your Indian ringneck parrot. The base of her diet should be made up of a good quality parrot seed or pellet mix. Seeds should be fed in moderation to avoid obesity, but are an important source of protein for your bird. Feed her a wide range of fruits and vegetable each day, such as melon, apple, kale, strawberries, carrots, collard greens and banana. Don't feed avocado, as it can be toxic to these birds. While all Indian ringnecks have different personalities -- some cuddly and some more aloof -- all of them require abundant socialization. Parrots live in flocks in the wild, so if you're keeping just one, you need to be her flock. If nobody's home for most of the day, this might not be the pet for you. Keep her cage in the busiest room in the house, so she feels involved in family life. When someone's home, leave her cage door open, so she's free to hang out with you or to retreat to her cage when she wants to. Play is also extremely important to keep her entertained. She should have her own toys in her cage, but you should also devote some time each day to playing with her or teaching her tricks to offer mental stimulation. Even if your Indian ringneck seems in good health, a yearly checkup with a specialist avian vet is essential. Your feathered friend needs to be kept clean. Provide her with a large, shallow dish of water to bathe in. If your parrot won't bathe herself you'll need to wash her in the sink or take her in the shower. Ensure she dries off somewhere warm, so she doesn't get sick. She may also need to have her nails trimmed, but giving her rough perches in her cage can help avoid this.